Along with the 5010 ANSI implementation, many providers are now being required to provide additional information for the drugs they prescribe. We are going to focus on Medisoft v17+, because even though most of this information can be applied to older versions, only v17+ will has the supported parts which will allow for 5010 ANSI transmission of the NDC. NDCs are additional codes added to procedures to signify the type, quantity and method of the drug administered. Matching procedure codes to appropriate NDCs can be a trying process, but we will discuss more about this later in the tutorial. First we'll start by showing where NDC is applied in Medisoft and then we will go more into how to find the information to fill these locations. We recommend you add the NDCCode, NDCUnitCount, NDCUnitMeasurement, NDCUnitPrice, Procedure Description and the transaction Description fields to the transaction entry screen in Medisoft to facilitate adding additional information when entering information through transaction entry. This information can also be set for the transaction line by selecting the "Details" button, while the line is selected. For paper claims you may be required to copy the Procedure Description field to the Description (transaction) field, because paper claims require both the NDC and the short drug description in the space above the transaction line on the claim form. We have found one of the most difficult things about billing procedures with NDCs is matching up the correct NDC to bill with the appropriate information. Below we have listed some of the ways we have found to make this process easier, however in some cases (most, really) you will end up having to bill the procedure w/ code and details to find out if it will pay correctly by that specific carrier. Different carriers may have different requirements for the Procedure Code, NDC or its additional information, normally you can base the majority of your information on Medicare's requirements but this may not always apply with other carriers. The first thing is to try to find out as much as you can about the procedure code, the drug you are using and any other information from the carrier you are trying to bill or the Representative/Distributor of the particular drug itself. This can be tedious, especially if you are just getting started billing out NDCs for a practice that has been billing previously or has a large number of procedure codes that require NDC. This process, although trying maybe actually faster than the other option which is to bill out and wait for a payment or denial and then possibly have to re-bill with different information. Majority of the time the carrier is not going to be able to tell you prior to billing the code at least once, in my experience at least. Check with the carrier or on their site for an HCPCS-NDC-J-Code Crosswalk which would provide you with all the information you need specific to that carriers requirements. Most do not offer this very helpful tool, but Noridian does and have been keeping it up to date month to month in 2012. Or you can use the FDA's NDC search or even download their database information and use that if you wish. You can normally find an 11-digit NDC number printed on the drug package in a 5-4-2 format. 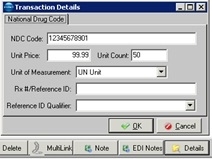 The first five digits of the NDC identify the drug manufacturer, the next four identify the specific product and the last two identify the package size. You may be able to use this knowledge to further your search for the correct NDC if the code on the drug package is not the appropriate NDC to bill under the procedure/diagnosis on the claim. If you can easily find the code/NDC Noridian's crosswalk, use the FDA search to find the drug and then try to find the result on the crosswalk would be the best route to take. Once the drug is found on the crosswalk, you will have you J-Code, NDC, short description, Unit of Measurement and Unit count. The unit of measurement and unit count can vary depending on the carrier, however we have found most carriers require the Unit of Measurement to be "Units" and the Unit count to be the amount of "Units" per "transaction/dose". (ex 50Mg of DrugA=Unit of Measurement will be 'Unit' where 1Mg=1Unit & Unit Count will be '50'. The transaction would then have only 1 unit on the 'Units to bill' because the drug dose of 50Mg was only administered once. 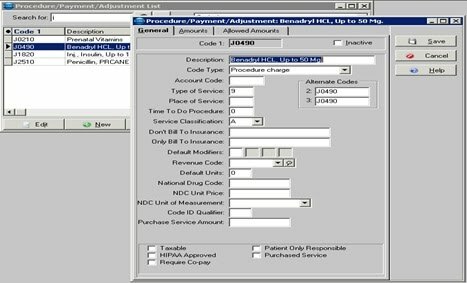 You should check with the Carrier you are trying to bill to or your drug's representative for more information about the Unit Price or anything else discussed in this tutorial not directly relating to Medisoft's data entry. For any and all other questions you may contact Medical Data Solutions support for more information or training if you would like. All the information used as examples in this tutorial are purely fictional and any relation to actual medical information or billing is purely coincidental. Please use this tutorial's information for reference purposes only!